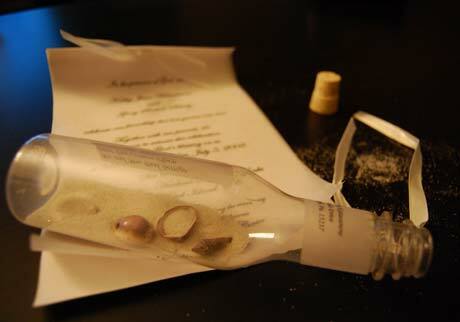 For wedding invitations with a more creative element, try rolling them up and slipping them into a bottle. These would work great for a beach wedding celebration or a wedding with a casual tropical theme. Before you make invitations in a bottle be sure that you check out in advance how much it will cost you to post them. Invitations like this are generally quite expensive to post as they will need to go as a parcel and not a letter. Plastic bottles will be cheaper to buy as well as cheaper to post due to weight. They will also be safer to post and will require less packaging material. Print your invitation on to white or craft paper. You can keep it quite simple and will not need to embellish it to much. The bottles come in a variety of shapes and sizes. They can be made from either plastic or glass, will have a regular screw on lid or a cork stopper. Choose which bottle best suits your taste and wedding budget. Take into account packing materials for postage costs for a parcel. Take your bottle and fill it with a small amount of sand (you can purchase nice white sand from some craft stores and online specialist bottle stores. You can also use a colored sand if you wish. www.sandartsupplies.com sells a range of bottles and sand. 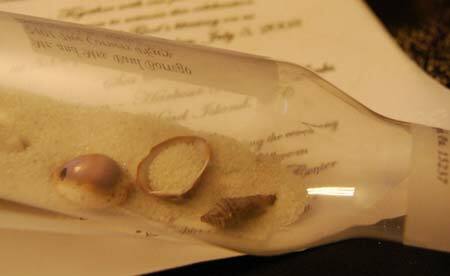 Add a few small shells to embellish your invites, roll up your invitation and insert it into the bottle. Create labels with the adhesive labels that you can buy form any Stationary Store. Stick them on to the bottle along with a sticker for your return address on the bottle neck. You can send your invitations as they are but I would recommend that you package them first to avoid destruction. Tie some raffia or ribbon around the neck of the bottle. If you want to age your invitations you can stain it with strong black tea.